Outside of Expowest. Real Bird of Paradise flowers! 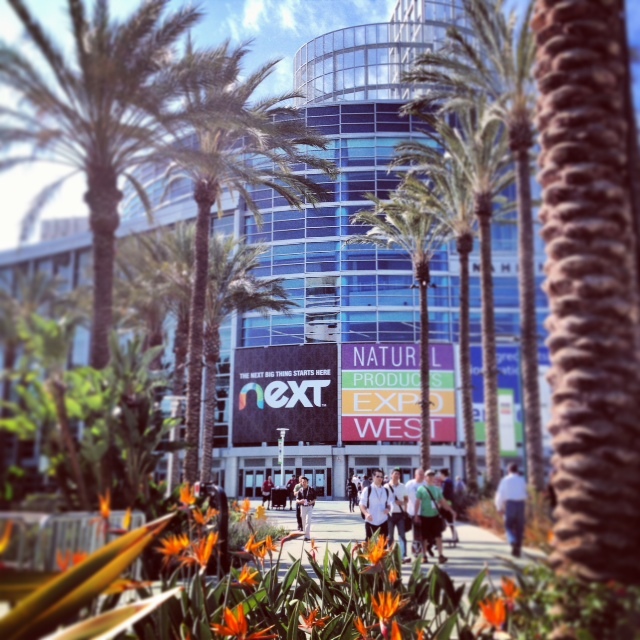 As I was approaching the convention center for Expo West, the Natural Products Expo, I couldn’t help but feel happy being in L.A. Sunshine, palm trees and healthy food and product heaven. If you shop at Whole Foods, Wegmans, or farmers’ markets, you know what I mean. 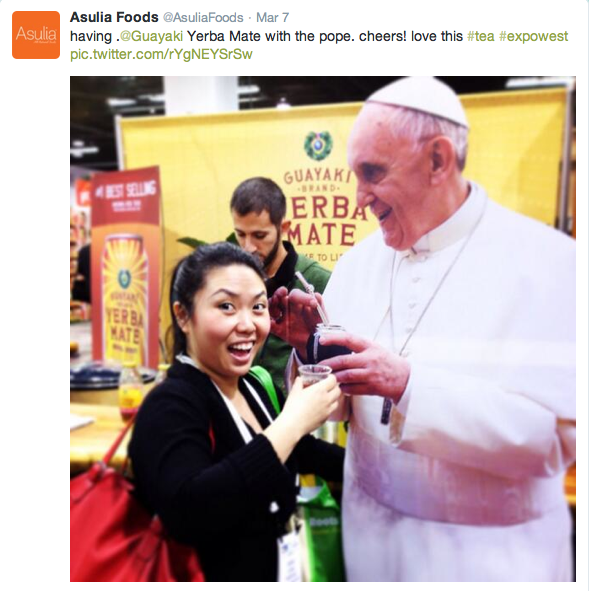 I tasted and tried hundreds of tasty and innovative new products. I love my job. 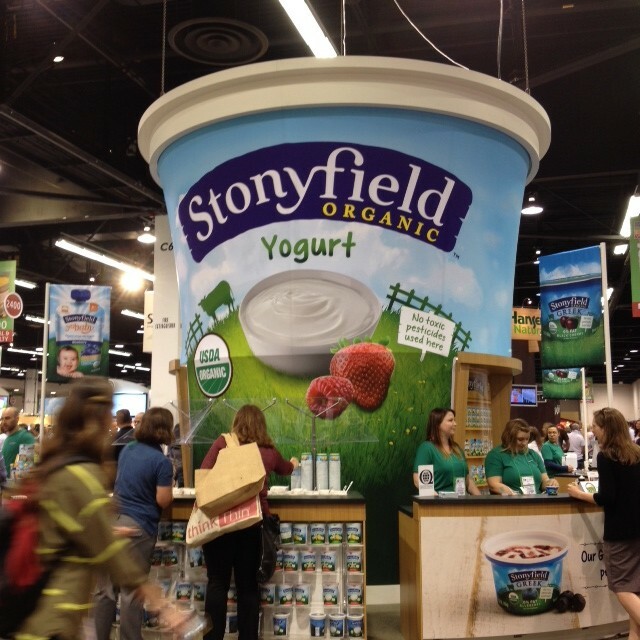 World’s largest cup of yogurt? People have meetings inside! 1. Byarozavik, birch tree water drink. Yup that’s right, water from a tree. It’s slightly sweet and unlike anything I’ve ever tasted. It a natural source of electrolytes and antioxidants. Move over coconut water? 2. Eco Nuts. Where have I been? These soap berries grow in the Himalayas. The nut inside is a natural laundry detergent. Simply put 4-5 nuts in a re-useable pouch and use it in place of your laundry detergent. It also acts like a natural fabric softener and is gentler on fibers. I can’t wait to do laundry! 3. Kind Snack’s newest savory bars. I absolutely loved the honey mustard flavor. It reminded me of the honey mustard pretzels I get on occasional road trips, but these are healthier. 4. Belvoir Fruit Farms, elderflower drink. Delicious, clean, subtle fruity flavor. If you love St. Germain in cocktails like I do, you’ll love this. 5. Make a Stand. It’s lemonade, but not just that. It all began when Vienne, an 8 year old girl saw a photo of two kids in slavery. She setup a lemonade stand to raise money to help, not just for a few days, but for 365 days! This inspirational little girl has gotten help and now it’s bottled. It’s yummy and 5% of proceeds go towards NGO’s that help children. Similar to Asulia, they are a for-profit which allows them to run a business and grow better than a traditional non-profit model. Thanks to air miles, I took an early morning flight to and red eye back to beantown. I was able to attend and support current and new food friends. There’s an instant camaraderie between entrepreneurs because we know first hand the ups and downs of what it’s like. The lack of sleep, wondering if you’re ever doing enough, managing limited resources, the joy of seeing what you made out in the market, and more. I left the expo encouraged by the friends I chatted with. Their words of support and advice remind me, I’m not alone. Try something new today. Blend a taro root smoothie!